This week, it is Invisible Kingdom #1. Written by G. Willow Wilson (Ms. Marvel, Wonder Woman) with art by Christian Ward (ODY-C, Black Bolt) and letters by Sal Cipriano (Detective Comics, Hellblazer), this debut issue takes readers to an immersive sci-fi world with a multi-faceted story and striking artwork. Note: This review reveals major plot points. How do you create a relationship between characters when they aren’t aware of the other’s existence? 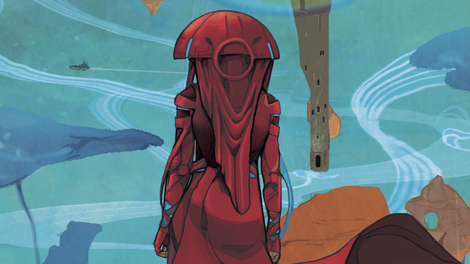 The two central figures of Dark Horse Comics and Berger Books’ Invisible Kingdom never interact in the first issue, but writer G. Willow Wilson and artist Christian Ward build a strong connection with parallel storylines tied by visual reflections. Grix, a freighter pilot stuck on a moon after her ship experiences a mechanical issue, and Vess, a new addition to a floating space-convent, live totally separate lives, but over the course of Invisible Kingdom #1 they make discoveries that will eventually drive them together. The opening chapter of this ongoing series prioritizes atmosphere, establishing specific tones for the two characters’ plot threads to inform their personal dispositions. The Grix scenes are high-energy and conflict-heavy as the pilot and her crew try to figure out the next steps for their delayed delivery, but Vess’ scenes are on a much quieter, contemplative wavelength as she gives up her old life and pledges her devotion to the Siblings of Severity. Grix’s predicament creates a sense of urgency while Vess reveals more of the book’s environment and culture, and the creative team adjusts its storytelling to suit the needs of each character track. The Grix story operates on a grand scale, starting with a ship speeding through the stars and later introducing a massive corporate conspiracy. Ward uses a lot of widescreen panels to play up the spectacle and keep the action moving on a steady beat, but when the plot shifts to Vess, Ward varies the layouts to change the rhythm and take the reader on a new path through the page. When Vess is introduces, Ward transitions out of the Grix scene by holding on to the widescreen panels for the establishing shots, but once he’s situated in the scene, he switches to a new angle and a new page design. When Vess receives help from a stranger on her blind walk through the city, Ward begins with a zoomed out aerial shot of the street, setting a measurable physical distance that the scene covers by layering panels on top of that original image. When the conversation ends, Vess has reached the endpoint shown earlier. Transitions play a vital role in unifying the characters, with three specific points where their experiences are visually paired. The first is two close-up panels of the characters in profile, with Vess’ panel packed with Lux logos in the background that foreshadow a more explicit tie between Vess’ religion and Grix’s corporate employer. This tie is further supported in the last transition, which shows a disheartened Grix sitting on the floor after learning of Lux’s criminal business practices before jumping to Vess as she prepares for her initiation, situated in the same space Grix occupies in the preceding panel. The middle transition is the most dramatic, with two consecutive splash pages presenting significant moments for Grix and Vess. I waited until I had a print copy before I read Invisible Kingdom, and it proved to be the ideal way to read it thanks to the physical properties of a paper single issue and how they distinguish it from a digital version. These two splash pages would stand alone digitally, but in print they are presented side-by-side, merging into a single visual that accentuates the characters’ connection and contrast. The image of Grix’s ship landing on the surface of a moon is loud and forceful, filled with neon colors and bold graphic design elements that add a layer of cosmic psychedelia to the shot. The tone shifts drastically for the splash page of Vess walking through a tight alley toward the nunnery floating in the distance, with Ward creating a more restricted composition and dulling the color palette so that the eye hones in on Vess’ bright red robes. It’s an image that projects solitude and perseverance, underlining Vess’ determination on her lonely path to the Invisible Kingdom. The side-by-side splash pages also align with the front and inside covers, and you can easily flip between those complementary images in print by layering one over the other in a way that you can’t with a digital copy. The page with Grix’s ship aligns with the inside cover, which shows a static-y image of the planet Qari and its neighboring moon. That image is the foundation for the first two panels of the issue, which show the ship hurtling toward the planet and flying through a shipping delay notification projected into space. There’s a sense of propulsion at the core of Grix’s introduction, ending with a violent landing that brings the reader closer to the pink-ringed planet. Just as Vess’ splash page is more character focused, so is its relationship to the front cover. Wearing the full veil of the Siblings of Severity, the Vess shown on the cover has a much more confident, powerful posture than the one blindly making her way through the alley. The open composition and vibrant palette are much closer to the Grix splash, and rather than having the nunnery loom high above her, its placed at a lower eye-line to suggest that this version of Vess is at a different point in her spiritual journey, where the ideals of her religion are easier for her to grasp. Wilson emphasizes how the Siblings of Severity relinquish their former identities by calling them “Nones,” a bit of printed wordplay that would be lost in spoken dialogue. The design for the Nones’ veils is like the bonnets from The Handmaid’s Tale by way of Spaceballs’ Dark Helmet, giving them a distinct silhouette that also serves a deeper narrative purpose. In an interview with Entertainment Weekly, Ward talks about how the designs for the Nones and their nunnery are all built around the idea of introspection being the way you reach the Invisible Kingdom. The domed design of the helmet obscures the Nones’ vision so they gaze inward, and the hole at the center of the nunnery draws focus toward the core, reflecting the Nones’ personal journey through the architecture. The larger shape of the nunnery also speaks to this penetrating quality, with the rounded top and sharp bottom making it look like a nail that could be pounded into the planet’s surface with a big enough hammer. Invisible Kingdom is arguably the biggest release from Berger Books, with Wilson and Ward’s reputations lending it a lot of prestige. Karen Berger’s imprint hasn’t lit the industry on fire, but its sci-fi series stand out as particularly compelling stories. The highlight of the imprint, Ann Nocenti and David Aja’s The Seeds, offers a striking look at an alien invasion in a dystopian near-future, but unfortunately the book has been plagued by significant delays that have kept it off the stands for over six months now. Nnedi Okorafor, Tana Ford, and James Devlin’s Laguardia is a much brighter sci-fi tale about alien immigration that is full of imagination and heart, with Okorafor’s big ideas translating beautifully to the page through Ford and Devlin’s artwork. Unlike these two series, Invisible Kingdom is set in a universe far away from our own, allowing the creators to push themselves as they introduce new worlds. Invisible Kingdom is packed with ideas but Wilson doesn’t go overboard with world-building in her scripting, instead welcoming readers into a lived-in world and letting them get their bearings as they familiarize themselves with the characters, culture, and environment. She recognizes that Ward is going to give readers a lot to take in with his artwork, so she puts him in the driver’s seat and lets the visual information be as important as the text. It’s a smart move because Ward is outstanding. He’s a digital artist who still holds on to a handcrafted look, using different brushes, lineweights, and manipulation effects to add tactile texture to the pages. His lines aren’t perfectly clean but they have a graceful flow that imbues his figures with vitality, and Sal Cipriano’s lettering carries that slightly shaky line over to the word balloons, which vary in thickness around the edges to make them look hand-drawn with an ink brush. It’s been a long time since Wilson created her own comic-book world, and teaming with a forward-thinking artist like Ward gives her the freedom to venture outside the box and trust that her collaborator will not only realize but elevate her ideas. It’s a phenomenal creative partnership, marking another major step in Wilson’s big 2019. She wrapped up a five-year run on Ms. Marvel that gave the Marvel Universe one of its greatest young heroes in Kamala Khan, and is keeping one foot in the world of superheroes by bringing new depth and intrigue to the ongoing Wonder Woman series. Invisible Kingdom is her first creator-owned comic in nearly a decade, and this month also sees the release of her first prose novel in seven years, The Bird King. She showcases the range of her talent with all these different projects, and her value to the comics industry is especially apparent thanks to her understanding of the medium’s mechanics and commitment to tight collaboration. Wilson’s Ms. Marvel is easily in the top superhero runs of this decade, using Kamala’s Muslim and Pakistani roots to give readers a hero who broke the mold while still embodying classic genre themes. It also had Wilson working with a lot of different artists, teaching her how to script stories in a way that left plenty of room for her collaborators’ specific points of view. The superhero skills Wilson honed on Ms. Marvel have made her an exceptional fit for Wonder Woman. The book has blossomed thanks to Wilson’s expansion of the book’s supporting cast, her empathetic approach to the hero’s relationships with her rogues, and the addition of sociopolitical commentary that explores concepts like violent uprising in foreign countries, refugees coming to the United States, and corporate manipulation of the legal system. Wilson knows how to use fantastic circumstances to energize discourse surrounding real-world issues, and in Invisible Kingdom she’s looking at how religions and corporations work together to reinforce established power structures. 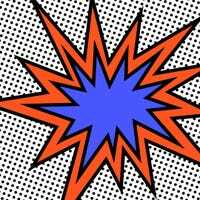 She’s laying the groundwork in this first issue, with her backmatter essay giving readers a tease of what’s to come as it breaks down what inspired her to write the comic. The backmatter also includes sketches from Ward that show different options of the Nones’ veils, the Lux spacecraft, and Grix’s facial embellishments, and it’s great to get a peek into both creators’ processes for crafting this series. It doesn’t require much work to print a couple extra pages with concept designs, and these offer insight into how Ward plays with shape, silhouette, and color until he finds the right solution for the story. There’s going to be much more for Ward to design as Invisible Kingdom grows, and this first issue introduces an exciting creative dynamic fueled by ambition and finely tuned craft.